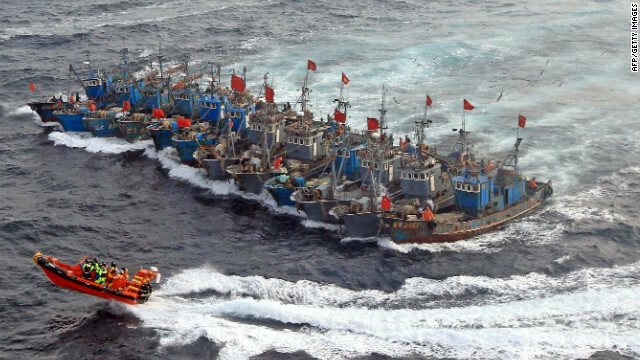 Chinese fishing boats encounter a South Korean coast guard boat while in the Yellow Sea in December 2010. Busan, South Korea (CNN) — A South Korean court on Thursday sentenced the captain of a Chinese fishing boat to 30 years in prison for murdering a South Korean coast guard officer during a confrontation in the Yellow Sea last year. The court in the port of Incheon also handed down prison terms to several other crew members of the Chinese vessel, which the South Korean coast guard officials boarded on December 12 because they suspected it of fishing illegally. The skipper of the fishing boat, Cheng Dawei, was convicted of stabbing the coast guard officer, Lee Cheng-ho, several times with a knife. Lee later died of his injuries and another coast guard official was wounded in the encounter. Prosecutors had sought the death penalty for Cheng, 43, but the court chose to give him a lengthy prison term and a fine of 20 million won, or about $17,500. Nine other Chinese sailors received sentences of one and a half to five years for their roles in the clash, according to Judge Rho Jong-chan, a spokesman for the court. The Yellow Sea, which contains important fishing and crab grounds, has been a point of contention for several Asian countries, most notably North and South Korea who have long disagreed on whose waters end where. The South Korean coast guard stopped hundreds of Chinese boats last year on suspicion of illegal fishing in the sea. Disputes over fishing rights have resulted in dozens of boat seizures.